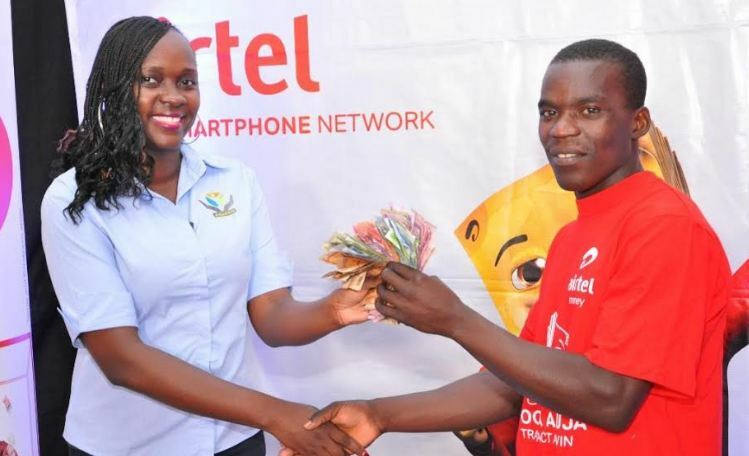 Airtel Uganda held the 4th draw of their ongoing Yoola Amajja promotion on Friday where 4 Airtel customers won cash worth UGx3,771,000 at their head offices on clement Hill. Namugaya Sandra, a resident of Bugembe , Jinja Distrcit and Kizza Charles, painter from Gayaza took home, UGX1.238,000 and UGX1,191,000 respectively. Other winners where Kimbugwe Gonzaga, a resident of Kajjansi who took home UGX580,000 and Mazolo Ezekiel an Electrician and resident of Kasese who took home UGX762,000. Commenting about the draw, Namugaya Sarah a business woman from Bugembe who owns a Mobile money kiosk said, “I am so excited about today; I have got more money to add into my business. I mainly use Airtel Money to send and receive money. Yoola Amajja encouraged me to do more things on the platform and I am glad that today I have been rewarded for it”. Airtel Uganda Customer Service Director, Lynda Nabayinda was present to handover money to the winners. “This is the 4 th draw of the promotion and our subscribers are being given an opportunity to win simply by transacting on Airtel Money. Through Yoola Amajja and similar promotions, we believe we are bettering the lives of our subscribers with Yoola Amajja.” She commented. “You can win up to UGX2,000,000 with a very low initial investment. Simply transact on Airtel Money at least thrice a week and you could be the next instant winner,” she added. To take part in the Yoola Amajja promotion, Airtel Money customers should dial *185# on their phones and carry out any 3 of these transactions weekly.